As if the disaster at Fukushima, Japan, wasn’t bad enough, it seems the U.S. military has its own looming nuclear bombshell in the South Pacific to deal with. Remember all of the nuclear and hydrogen bomb testing that went on just after World War II? We’ve seen spectacular pictures of the massive mushroom clouds, and even pictures of anchored ships being engulfed by the effects of the bombing that went on in the Marshall Islands, a chain of atolls lying in the heart of the Pacific Ocean, about half-way between the Hawaiian Islands and Australia. Did you ever wonder how much bombing went on in that remote part of the world? And where did the U.S. store all of the nuclear waste created by all of that bomb testing? 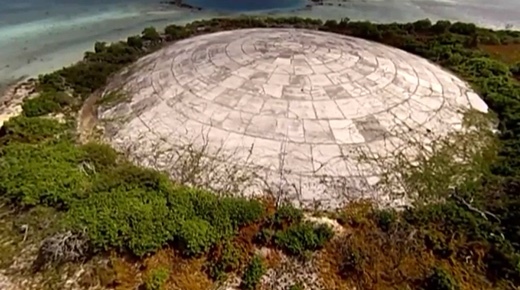 It seems that a giant concrete parapet known as the Runit Dome, was constructed on a bomb crater on Enewetak Atoll’s Runit Island in 1979 to contain an estimated 111,000 cubic yards of deadly waste created from 12 years of bomb testing. The designers of the dome apparently believed the dome would be a permanent solution to storing the highly radioactive debris. But they were wrong. Now the great dome is being affected by rising ocean water levels. Portions of the dome are cracking and leaking. The U.S. Department of Energy, in a 2013 report, notes that radioactive waste is leaching into the island. The report states that the soil around the dome is as contaminated as the stuff inside. The fear is that with the rising water levels from the melting ice caps have put the dome in danger of even more damage. The concern is that a storm surge, typhoon or other cataclysmic event caused by climate change will tear open the massive dome and release its contents into the Pacific Ocean. A total of 67 nuclear and hydrogen bombs were detonated on the Enewetak and Bikini atolls between 1946 and 1958. The natives that lived on the islands were moved to other island locations, allegedly out of harm’s way. A three-year effort to decontaminate the islands was conducted in the 1970s. One report said the military mixed over 111,000 cubic yards of contaminated soil and debris with cement and buried it in a blast crater that was 350-feet wide and 30 feet deep. Then the dome was created out of 358 concrete panels, each 18 inches thick. A New York Times report, however, said the site was never designed to last. The story said the work crews simply bulldozed “as much plutonium-contaminated soil as it could gather into a 33-foot-deep crater on Runit that had been carved out in 1958 by a bomb roughly the size of the one detonated over Hiroshima.” They also filled 437 plastic bags with plutonium chunks picked up from the ground, left from a misfired bomb. These also were tossed into the crater. All of this debris was then covered with an 18-inch-thick concrete cap. “Most of the rest of the radioactive waste, with too little plutonium to trouble with, was bulldozed into the lagoon, over the objections of the Environmental Protection Agency and the displaced people of Enewetak. American officials chose to leave radiation on the land at levels far higher than would be allowed after a similar cleanup in the United States,” the story said. In recent years large cracks have been spotted in the dome, the land and waters surrounding the island are dangerously radioactive, and plutonium isotopes from the Marshall Islands site have been found in the South China Sea some 2,800 miles away. The island, which is only about six feet above sea level, is expected to be totally submerged by rising sea levels in the next few years. While Japanese authorities are working hard to do something about the contamination created by the Fukushima disaster, it appears that the United States military is ignoring the cracking nuke dome at Enewetak.